Since 1999, we've completed thousands of successful projects and everyone on our staff has between 15 and 30 years of experience in the field. We're trusted by many prominent builders, engineers, and architects throughout San Diego County and receive about a third of our business from referrals, which is a testament to our honesty, professionalism, reliability, high-quality work, and fair prices. With Hidden Valley Backhoe, one call does it all. Since we're able to perform multiple scopes of work, we're able to save our clients time, money, and frustration. 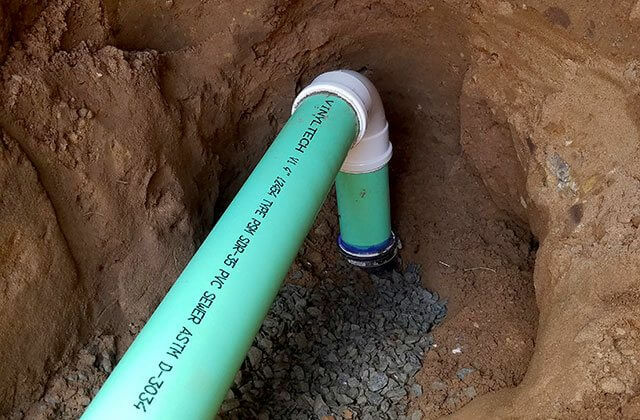 By hiring Hidden Valley to handle a utility service upgrade or site prep work, you won't have to worry about getting multiple bids, scheduling delays, communication issues, or paying a separate markup to each contractor. We're focused on customer satisfaction. As such, we go above and beyond to make sure your job is done right the first time. Free Estimates. Competitive Prices. Timely Completion. Guaranteed Work. Call today to schedule a free on-site consultation for all your digging, demolition, trenching, grading, hauling, and concrete/asphalt needs throughout San Diego, Escondido, Rancho Bernardo, Poway, and surrounding areas. Our prices are competitive, and we provide accurate, upfront quote. We also offer a 10% discount for the military and first responders. All work is performed to code and backed by a written warranty. We're typically work Monday through Friday, from 7am to 5pm, but we can also accommodate requests for emergency service for broken water and sewer line repairs. At Hidden Valley Backhoe & Trucking, Inc., we work hand in hand with San Diego utility companies to install, repair, replace, and upgrade service lines. 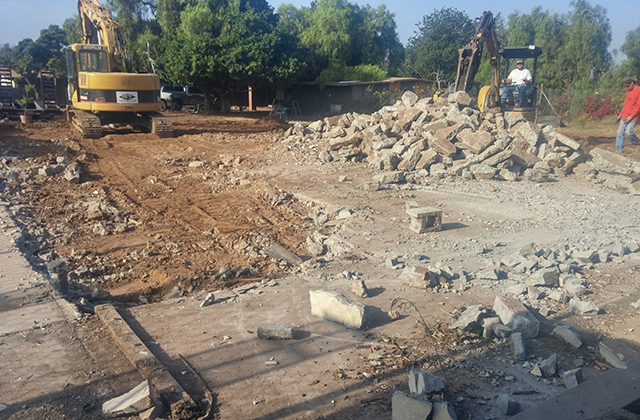 Depending upon the project, we may provide concrete/asphalt demolition, trenching, pipe laying, backfilling, soil compaction, asphalt/concrete repairs, and service hook up. 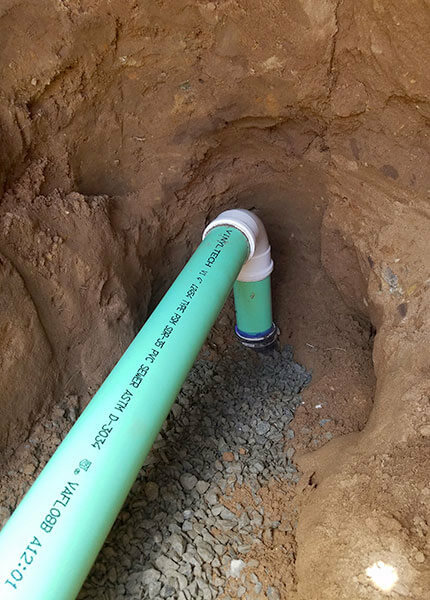 We have more than a decade of experience installing, repairing, and upgrading wet and dry utilities, including gas, electric, cable, telephone, water, sewer, and septic, and we're a SDG&E Certified Gas Pipeline Contractor, which means that we're qualified to work on and around gas lines. All work is done to code and guaranteed. Call today for a free on-site consultation and quote. We can provide a comprehensive upfront quote, or provide bids for each phase of the project. In many cases, by giving San Diego clients one contractor to work with, our clients are able to avoid the additional price markups, potential time delays, and frustration that can result from working with multiple different contractors. If you have a broken sewer or water line that you need repaired promptly, call Hidden Valley Backhoe. We can provide emergency service for water and sewer line repairs in San Diego, Poway, Rancho Bernardo, Escondido, and other nearby areas. 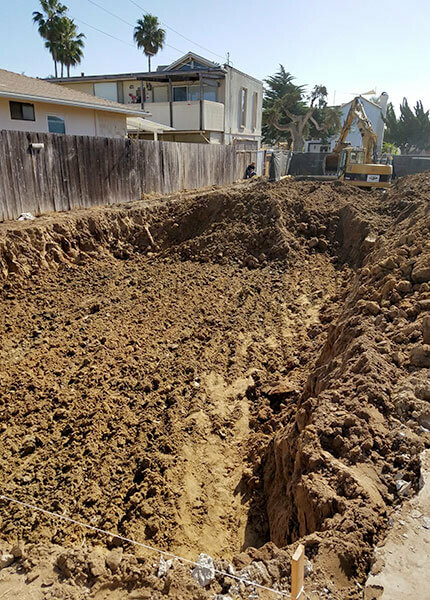 Our experienced technicians will come out, cut away and remove concrete/asphalt, dig the trench, replace the pipe, and then backfill and re-compact the soil. Call us today to learn more. 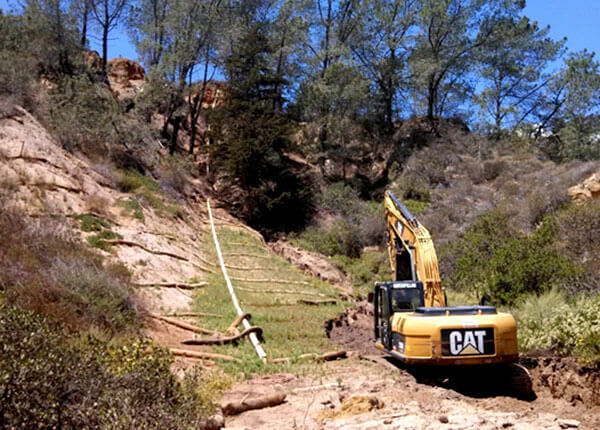 Whether you need some help adjusting the slope in your backyard to correct a drainage issue or are looking for a qualified contractor to work with engineering plans to prepare a site prior to a new construction or remodeling project in the San Diego or Escondido area, call the grading experts at Hidden Valley Backhoe & Trucking Inc. Everyone on our team has more than 15 years of experience in rough grading and finish grading, which includes excavating, earth moving, soil compaction, grade checking, and leveling. We can work with plans provided by an engineer, have a surveyor come out and identify an elevation benchmark, ensure that the finished topography matches the plans, and complete all work to code. When we're done, your site will be completely ready for the next phase of construction. Call us today for a free on-site consultation and estimate for grading and other backhoe services. 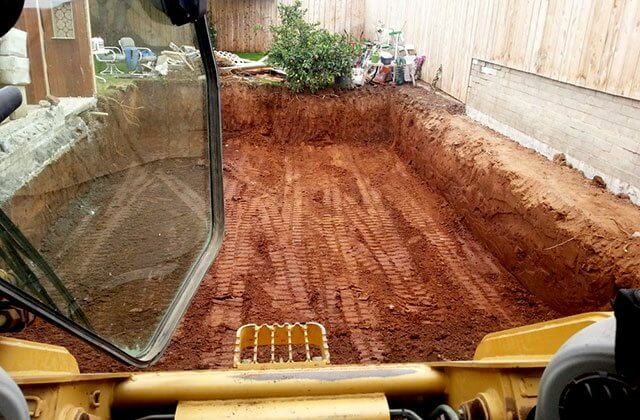 With any new construction or remodeling project, the work site must have soil that is correctly compacted and graded. If not performed correctly, the ground could move or sink over time, potentially leading to a sagging roof, cracks in the stucco or slab, and other problems. This type of damage is not only costly, but also dangerous. By working with Hidden Valley Backhoe, you can be confident that your site will be properly prepared for your building project. 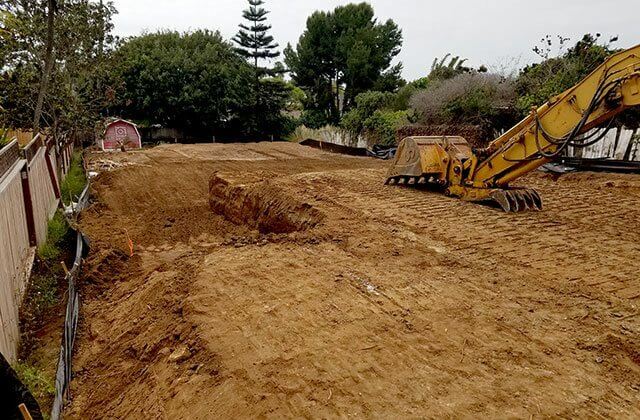 We have provided excavation, rough grading, soil compaction, and finish grading services to clients throughout San Diego, Poway, Rancho Bernardo, Escondido, and other nearby areas since 1999. Because we are a highly experienced, fully licensed General Engineering Contractor, you can be confident that your job will be done right the first time. Call today for a free on-site consultation and estimate. Hidden Valley Backhoe provides dirt/soil import and export services in San Diego, Poway, Escondido, Rancho Bernardo, and surrounding areas. 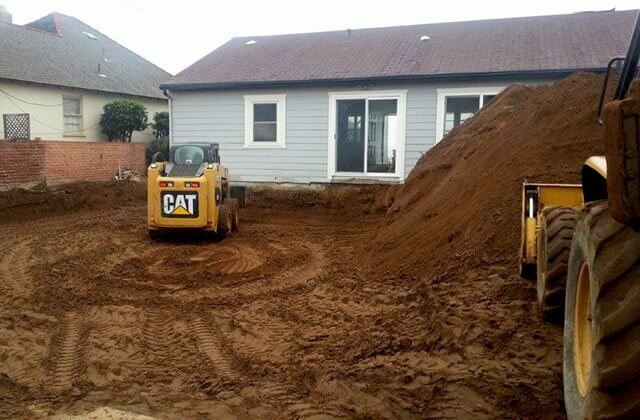 With our soil import service, we're able to truck in fill dirt to even out or raise your foundation. Once delivered, we typically spread out the dirt and compact it to meet the soil engineer's specifications. For those who need to have a large amount of dirt or soil removed from their property, we offer soil export. Whenever possible, we try to coordinate our fill dirt import and export services so that our clients can enjoy maximum cost efficiency. We completed this single family home demolition in San Diego, CA. We hauled away all of the debris and re-compacted the soil in preparation for the new build.